This event will take place in the Agora space, at the University Center of University of Ottawa, November 30th, 2013, between 5:30 and 9pm. Entrance is free. The event’s main guest is Mihai Margineanu, touring Canada, and making and unscheduled stop in Ottawa to participate in our Celebration. The feature presentation, Mr. Margineanu and his band’s concert. The organizing committee will prepare a couple of Romanian Traditional Dishes, amongst which sarmale (rolled cabbage and wine leaves with vegetables, rice and meat filling), zacusca (a cold veegtables dip), Romanian-style meat balls, egg-plant salad, and others. We will also provide tea, coffee and water. Feel free to bring any food, of your creation and liking, to share with friends, or to make new friends with! What better way to show your natural Romanian cooking and hosting skills than to surprise someone with home-made delicacies! 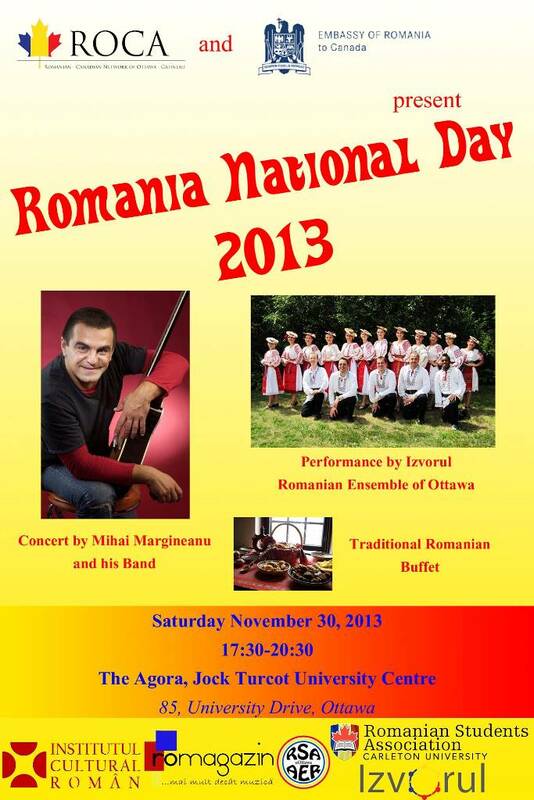 ROCA is a non profit organization, created in 2013 in response to a need of representation and access to cultural services within the Romanian-Canadian community of Ottawa-Gatineau. We provide a platform to facilitate communication within the community. We act as a portal with the aim of supporting and promoting the services offered by groups, institutions and individuals in the community, as well as events organized. Ultimately, we organize and participate in events in the community with the goal of promoting and showcasing Romanian culture and traditions. ROCA exists and operates due to the commitment of its volunteer coordinators. Among us you will find the leaders of the Romanian Student Associations of the University of Ottawa and Carleton, the hosts of Ottawa’s Romanian radio show Romagazin, the director of Ottawa’s Romanian Dance Ensemble and several individuals whose contributions have helped shape the community in the past years. Parking is available near the Brooks or Social Sciences Buildings (see map below), for a cost of $9 per day.